You like a little mystery. From Goodreads.com: "She knew what he wrote . . . One little word that made her feel both cheated and beloved. Caught in a web of jealousy and deceit that spiraled out of control, Meg’s choices in the past ultimately collide with Lucas’s discovery in the present, weaving together a taut story of unspoken secrets and the raw, complex passions of innocence lost." 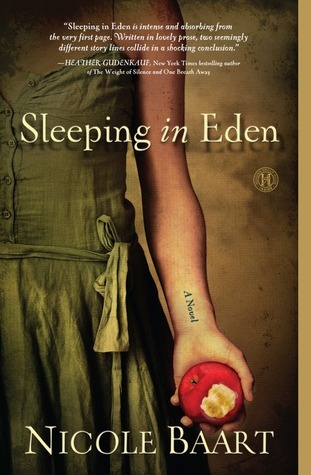 "Sleeping in Eden" is mystery told from the point of view of Lucas who is a doctor as well as someone whose life as he knows it is totally falling apart and it doesn't seem like he has any control over putting it back together. The other part of the story is told from the point of view of Meg is in the throws of first love with the person that she never expected to fall in love with. This book has a lot of mystery, which I really enjoyed. I love books with twists and turns. I thought that some of the twists didn't have as much oomph as the story kind of unwinds from two ends, Lucas' and Meg's. This is more a quiet mystery with a lot of layers and a lot of character development. Speaking of which, I really liked the characters in the book. Lucas is put in a weird position when it falls to him to investigate how Jim, the father of a girl that Lucas and his soon to be ex took care of and that his soon to be ex loved as a daughter. The point of this book is really that things are often much more different than they seem. Bottom line: This would be a great pick for anyone who likes really good character development. Sounds as if you really enjoyed the book and the characters! Glad it was a good one!